Shailene Woodley commits to her role as Tami, a bohemian young woman off to see the world, working odd jobs to make enough money to get her to the next stop. Complete with a puka shell necklace and sunkissed blonde highlights, she’s the embodiment of wanderlust; the girl who goes travelling on her gap year and never comes back. Watching a free spirit like Tami find herself in such dire circumstances is a convincing concept, an intrigue validated by Woodley’s fine depiction of harrowing exhaustion. Sam Claflin, on the other hand, gives a rather one-note performance, his sentimentality rarely convincing. Sure, there are some decent moments. 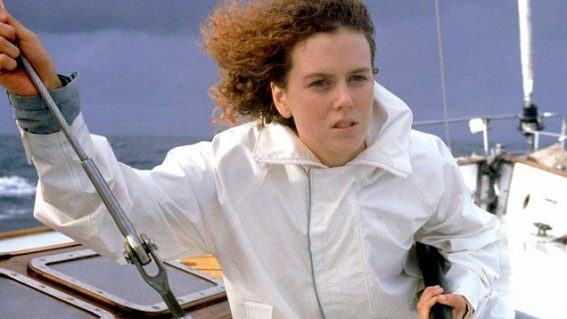 Both Tami and Richard are competent in the water; she’s a surfer, he’s a sailor; and the film serves as a reminder of the way disaster renders incompetent even the most experienced seafarer. On another occasion, days into the storm’s aftermath, Tami is delighted to find a tube of moisturiser and slathers it across Richard’s face, then her own; a small attempt at feeling human, despite the wreckage. Hayley Saw Adrift today and enjoyed it. A story of love and survival. Bawled my eyes out at the end. Want to read the book now. Tiina Cant wait to see this one! Kepa Hope to see it, onwards and upwards! Chris Yep. I'm in. Love these survival at sea stories.